The Soundweb London BLU-BIB or “break-in box” offers 8 channels of analog audio input expansion via the Soundweb London high bandwidth, fault tolerant digital audio bus. 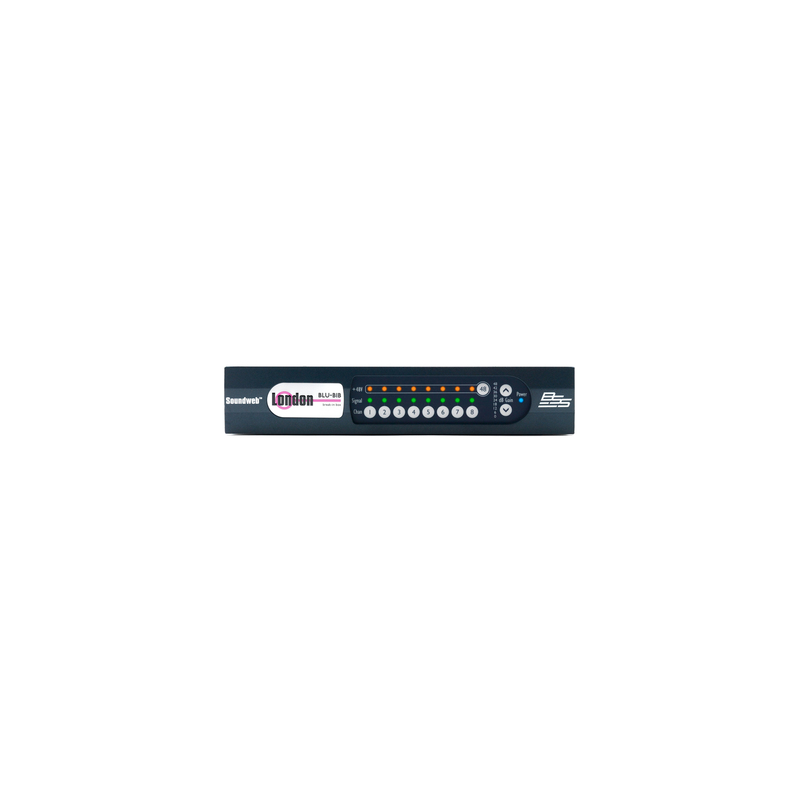 This expander features a low latency, fault tolerant digital audio bus of 256 channels which uses standard Category 5e cabling giving a distance of 100m between compatible devices. The BSS Audio MC-1 fiber optic media converter can be used to increase the distance between devices to over 10km (6.2 miles) using single mode fiber. The BLU-BIB input channels are easily configured by six DIP switches located on the rear of the device, which select consecutive channels in groups of eight. This simple configuration allows assignment to any 8-channel range within the 256 channels available on the digital audio bus. Input channel assignments are configured by DIP switch selection only. The BLU-BIB is not configured by HiQnet™ London Architect. Each channel’s input gain and Phantom Power are adjusted using buttons on the front panel. The 8 analog mic/line level inputs utilize the same terminal block connectors as the other members of the Soundweb London family. Signal present, clip, and Phantom Power per channel are displayed by front panel LED indicators. The front panel also contains a power status and applied gain LED indicators. The BLU-BIB operates in three different modes, which are entered and exited via the front panel controls. Edit Mode allows the user to adjust each channel’s input gain and Phantom Power. Normal Mode prevents the user from changing input gain or Phantom Power. Stealth Mode prevents the same changes from occurring, but without LED illumination (except power). The chassis is a half rack wide and can be rack mounted using the BSS Audio 1U Rack-Mount Kit. It can also be under-table mounted or wall mounted using the included mounting brackets. The BLU-BIB break-in box input expander is powered by a 12V DC adapter which is included with the device. The BLU-BIB and the other members of the Soundweb London family provide the building blocks of the perfectly tailored system solution.